Write Your Own Poetry by Laura Purdie Salas. A Write Your Own Book. Review: If you are the kind of person that is fascinated by the wonders of poetry then Write Your Own Poetry by Laura Puride Salas is a book for you. It is a very informative book that would be extremely helpful for any aspiring poets. The main idea of this book is that achieving a goal doesn't have to be difficult if you have the right amount of determination and tools. 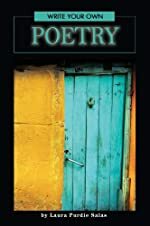 Personally, before reading this book, I never was interested in poetry, but now I realize what a great hobby it can be. Write Your Own Poetry made me really think about how these amazing works of poetry made by talented authors started off as nothing but fascinated people with a different way of looking at life. Some people may think poetry is boring, but anyone who enjoys music will realize that music is poetry. Songs have beats and poetry has meter. They are very much alike in many ways. I think that most of the smallest interests in your life can actually have a significant impact on your future. Most poets never have to think closely to make great work of poetry. I think this should be advice to anyone who desires to become a poet in the future; you don't have work so hard that your brain starts to hurt to make a good poem. Inspiration is everywhere. Whether it is from your family and friends or just an object in front of you, you can get inspiration from anywhere. I believe the author wrote this book so that people who are very fond of poetry and would like to write their own, could use this as a tool. I recommend this book to any students, especially the ones who are still trying to figure out their future because this would help them realize it's not hard to pursue a career as a poet. All in all, Write Your Own Poetry is a wonderful tool for people who enjoy reading and writing poetry. I believe that if you have ever felt like you don't belong or maybe you just have a different way of looking at things you should read this book so you can discover the stepping stones to writing poetry and having a future. Overall, Write Your Own Poetry is not only an excellent book for aspiring poets, but it is also great for teaching poetry. It's a valuable book for any poetry unit in school. We would like to thank Media Masters Publicity for providing a copy of Write Your Own Poetry for this review. Have you read Write Your Own Poetry? How would you rate it?